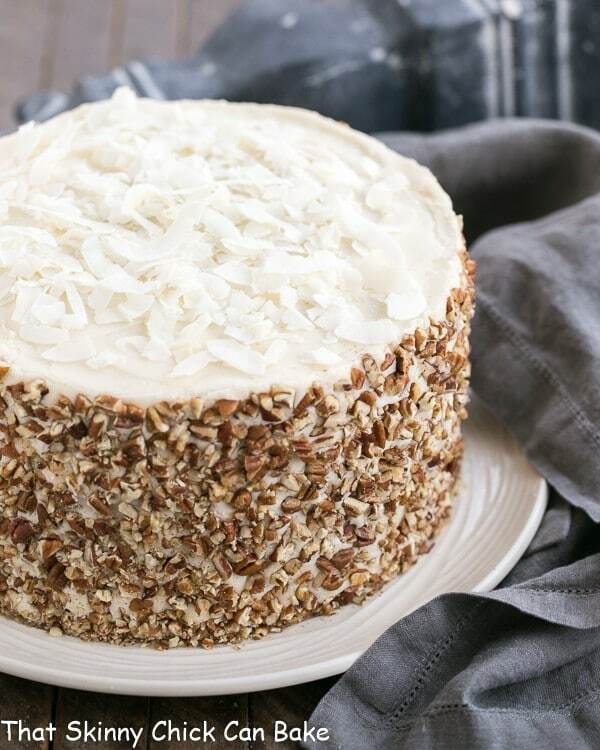 If I had to choose a favorite cake, it would be carrot cake, hands down. But not just any ordinary carrot cake; it must be chock full of goodies. For an extraordinary version, how about a Caramel Filled Carrot Cake with Cream Cheese Frosting? I love any excuse to bake up a decadent, over the top dessert. Especially one full of ingredients I love, but the family doesn’t: nuts, coconut, crushed pineapple. My book club provides me with all sorts of opportunities, and this week was our annual summer pitch in dinner. It’s no surprise that I always nab a dessert slot when it’s time to sign up. My friend, Roz, over at La Bella Vita, shared this marvelous three layer carrot cake with an added bonus: a caramel filling. She actually had a praline filling but I decided to use the extra nuts as a garnish and keep the extra layer simple, gooey and spectacular. And, of course, there’s the cream cheese frosting. Who doesn’t love that? Her Carrot Cake with Caramel Filling and Cream Cheese Frosting sounded exquisite. I just had to give it a shot. But it was my girlfriend, Kelly, who told me this was a must make recipe. You see, Kelly is friend I’ve had since 3rd grade…and we also shared many adventures in college…even a boyfriend…long story there. I knew “of” her sister, Roz, growing up, but she was a cool high school student and my friends and I were the pesky (and squirrely) friends of the baby sister. We actually “met”via our blogs not knowing we had a personal connection. Over weeks and months, we figured out we grew up only blocks from each other, plus actually met in person when Kelly and I road tripped to St. Louis while in college. 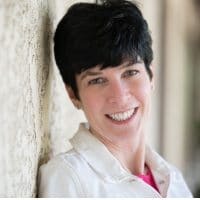 When Kelly and I were in Michigan this spring, she raved about her sister’s Carrot Cake With Praline Filling And Cream Cheese Frosting, more than once. A challenge I couldn’t resist. Kelly loved it. I loved it. My book club ador ed it. And just recently, I took it to the cardiac cath lab for a Christmas lunch and they loved it as well. I hope you will, too! An extraordinary carrot cake with a caramel filling. Adapted from La Bella Vita blog. Chopped pecans to garnish sides, optional. Butter and flour 3 9-inch round cake pans. Set aside. In the bowl of your stand mixer, add the flour, sugar, brown sugar, baking powder, baking soda, salt and cinnamon.Mix well. Add the oil, eggs, butter, vanilla, pineapple, coconut, pecans, and carrots. Place equal amounts of cake batter into each of three prepared pans. 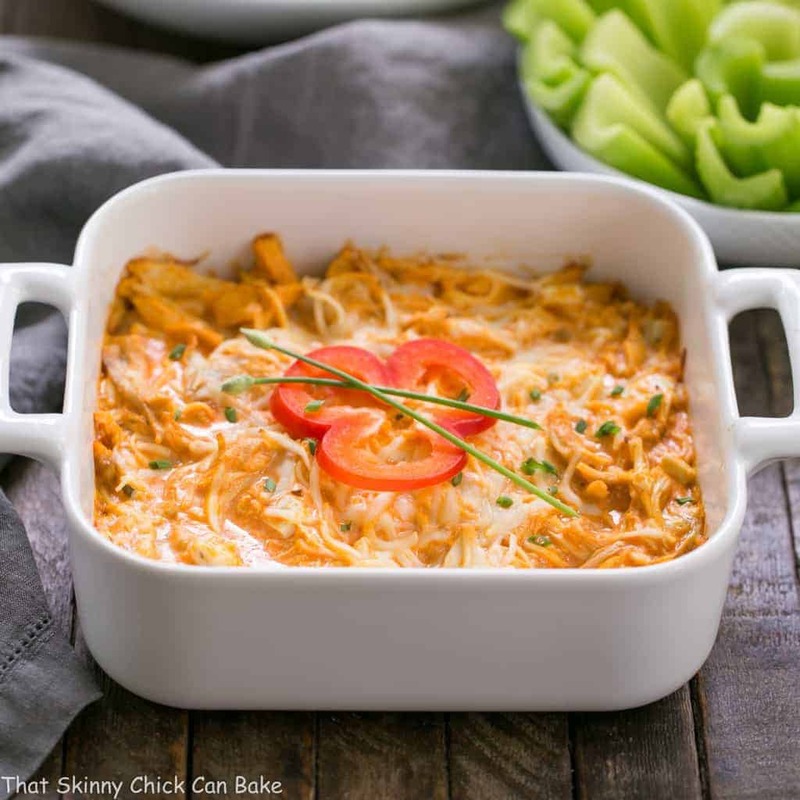 Bake for 35 – 40 minutes or until an inserted toothpick comes out clean.Place on baking racks to cool for 10 -15 minutes, then remove from pans to finish cooling. Prepare filling by melting the butter in a sauce pan. Add brown sugar and mix well. Add cream, vanilla and salt and mix to combine. Slowly add flour and cornstarch, whipping well to incorporate. Cook till mixture boils and thickens while whisking continuously. Run through a sieve to remove any lumps and place in fridge to cool completely (may chill overnight if necessary to thicken). Make frosting by beating together butter and cream cheese till light and fluffy. Add vanilla then mix in powdered sugar till desired consistency is reached. 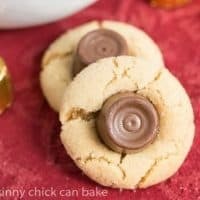 Top two of the layers with the caramel filling. If too runny, pop in the freezer till thickens. Spread a thick layer of the frosting over filling then stack these two layers. Top with third layer and frost the whole exterior as desired. Beware, that some caramel will ooze out. To minimize this, you may not want to use all the caramel. Garnish sides with chopped pecans if desired. Total time does not reflect cooling and chilling times. My layers started sliding when I stacked them. I inserted a couple wooden skewers to hold them in place. You can chill the cake thoroughly and remove them or cut them off at the cake’s surface and warn your guests before serving. The Instagram teaser I put on Facebook…look at that all that gooey caramel!!! Caramel makes everything better! This cake looks very tall and luxurious! This looks amazing and so delicious!! 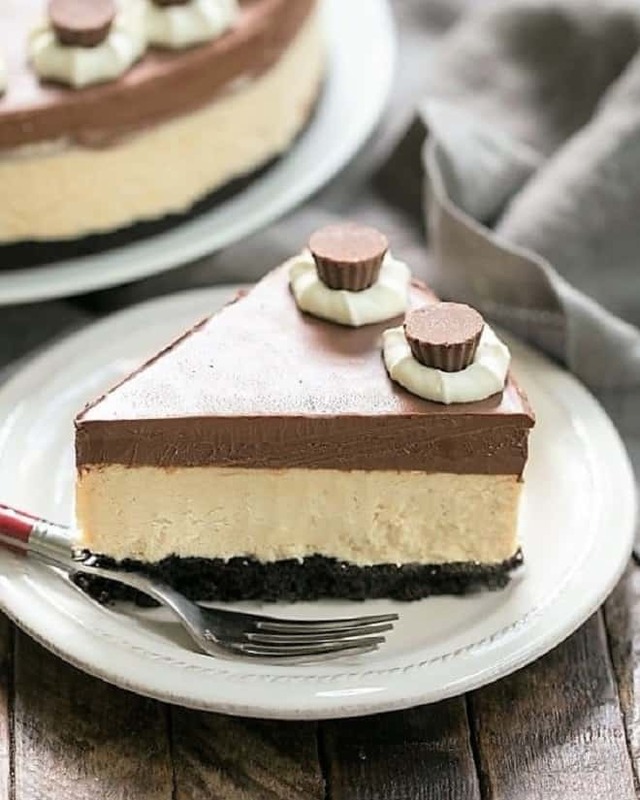 Wow imagine cutting into the layers, everyone will be so impressed! It is a small world. I definitely don’t make carrot cake enough. Must remedy that soon. I love carrot cake, really good carrot cake and I crave it!! Yours looks so insanely good. I have never seen one that looks that great!! 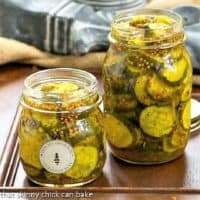 Thanks so much for this recipe!! This looks like the blue ribbon winner at the state fair. Decadent and delicious! Catch me!!! I’m swooning!!! Not just carrot cake… but filled with caramel? Then topped with cream cheese?? Summer’s almost over, who needs to fit into a swim suit anymore??? Count me in! I’ll never turn down caramel, never! And it looks so great in this carrot cake – really excellent idea. Great post – thanks. Would it make a big difference if I omit the pecans and shredded coconut (in the actual cake) and not make the caramel filling at all? I think it would be fine without the pecans, coconut and caramel, Ayesha 🙂 Hope you try it. I am sure your book club loved this goey cake. I am like you on signing up for dessert..Love the nuts and everything about this cake. Carmel?? Carrot cake???? Count us in!!! Beautiful cake!!! I’m quite sure they love it when you nab the dessert slot Liz! In fact, I bet they totally forget about the books, especially with a dessert like this one! YUM! Oh my gosh Liz, this cake looks so dreamy! I love the caramel you added to it! Just beautiful! This looks wonderful. We love carrot cake. In fact I just picked up ingredients to make mine for my kids bdays that we’re celebrating on Friday. I’ve never tried one with a praline filling – it sounds sinful. Beautiful cake Liz. It looks perfect. Carrot cake is my guilty pleasure. Yum! I would have swiped so much of that caramel before frosting the cake. Beautiful cake and what an autumn teaser! I am in love! This looks super! The addition of caramel is just superb. This is truly over-the-top gorgeous and I’ll bet super scrumptious! Carrot cake is one of my favorite! 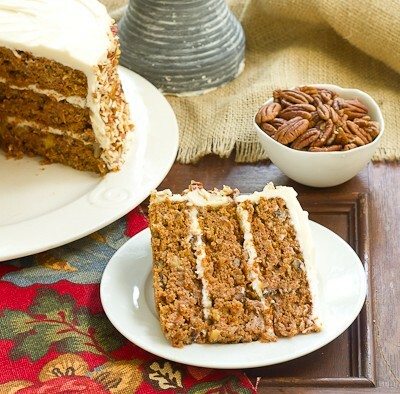 I am a big fan of carrot cake…Yours make me drool!!! Lizzy, this is incredible! I love carrot cake so much and I am crazy about that caramel filling! I need to find an excuse to make this ASAP. 🙂 There’s nothing in this that I don’t love! 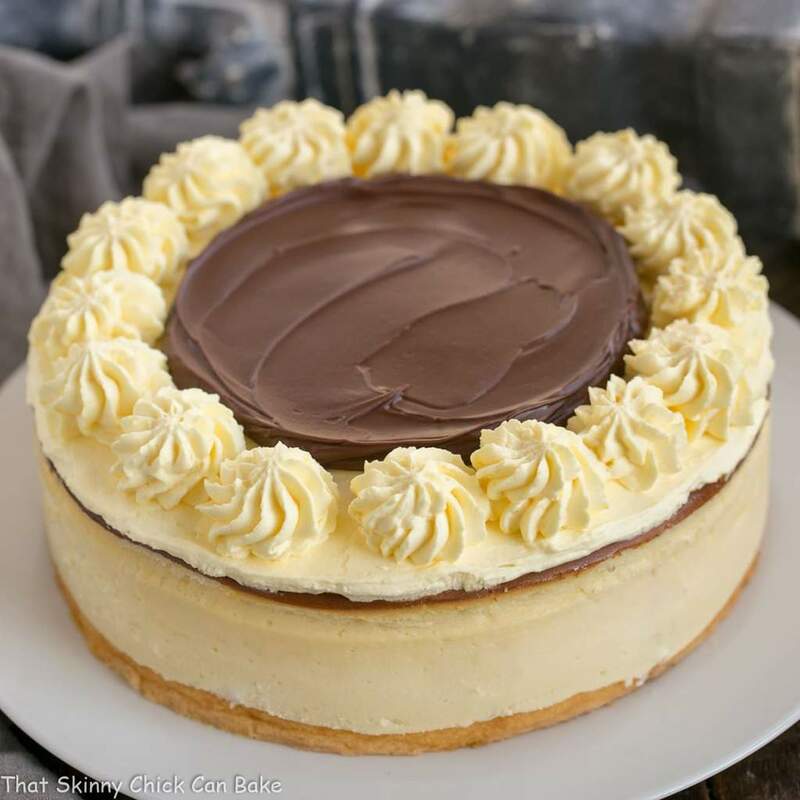 Such an incredible cake, I love that caramel filling – absolutely divine! I am drooling. 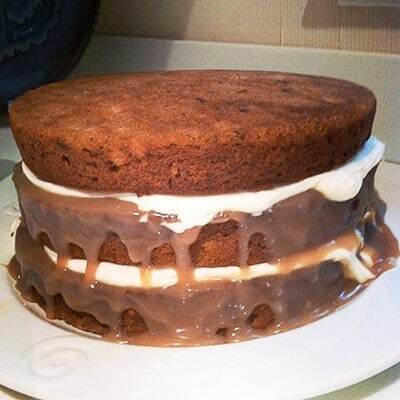 The caramel is a great addition to carrot cake. And there is just something special about a three layer cake. Wonderful! You are spot on Liz. This is definitely a decadent, over-the-top dessert. I always like an excuse to make such deliciously rich desserts too! 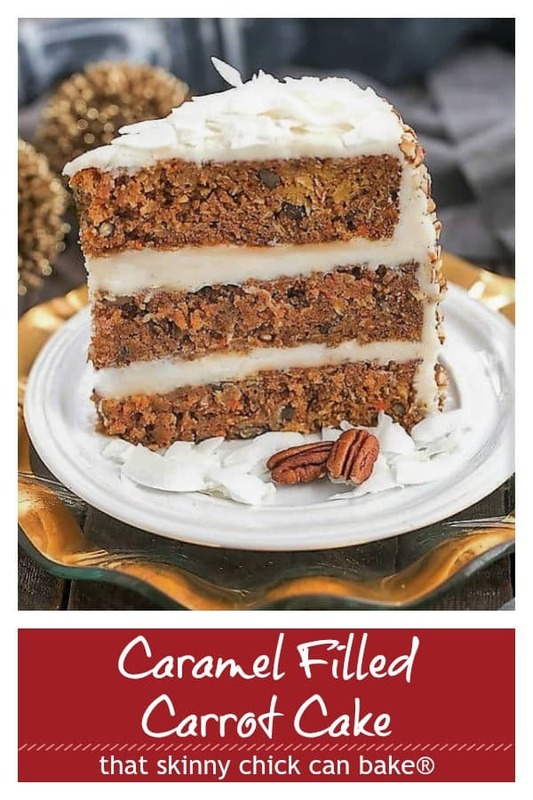 It must have been ages since I last baked and had a carrot cake….this sounds splendid with caramel filling! Oh Liz, you are so amazing!!!! This carrot cake turned out perfectly for you. I will have to tell Kelly to read your post . . . she’ll be in awe at how beautiful yours is! LOVE how you used the nuts to decorate the sides. Honestly, your book club must wait in utter anticipation for the decadent desserts that you bring to delight them! I know if I were present, I’d never speak a word; I’d just devour your desserts! Lizzy… this is one of the most beautiful things I have ever seen… this cake is AMAZING! Liz, this cake looks crazy good! That gooey caramel is a great twist and takes it over the top. Gorgeous cake, Liz! I love carrot cake and the caramel filling takes it over the top!! Wow. This looks amazing! Pinning this for later! It’s a beautiful and super delicious looking cake!! I think this is my new favorite cake. Gorgeous! 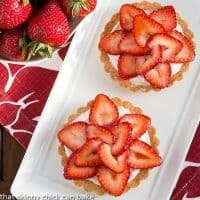 I have dinner group in a few weeks–this is in the running for the dessert (along with about 20 other recipes from your blog Liz)! What a marvelous dessert. Carrot cake has always been my favorite cake, ever…and I’m in love with caramel too. What a perfect combo. Thanks a million for sharing this, and linking back, at Weekend Potluck. Please come back soon. Just stopped back by to let you know that I linked it to my original post so you should see a pingback coming through at your end! Great job Liz!!!!! Liz, this cake is beautiful! And it looks super tasty. It’s NOMilicious! Pinned and sharing on FB and Twitter. Thanks for sharing at Marvelous Mondays! 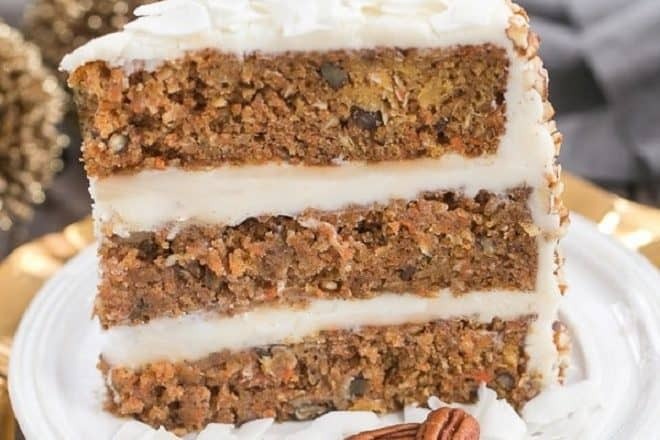 I love carrot cake, yours looks like a great version. I hate it when layers start to slide, it sends me into panic mode. I wouldn’t be able to stop at one piece of this cake. The recipe sounds fantastic! Thanks for being a part of the YBR. Thank you, Catalina! It was SO good! I don’t eat coconut at all. 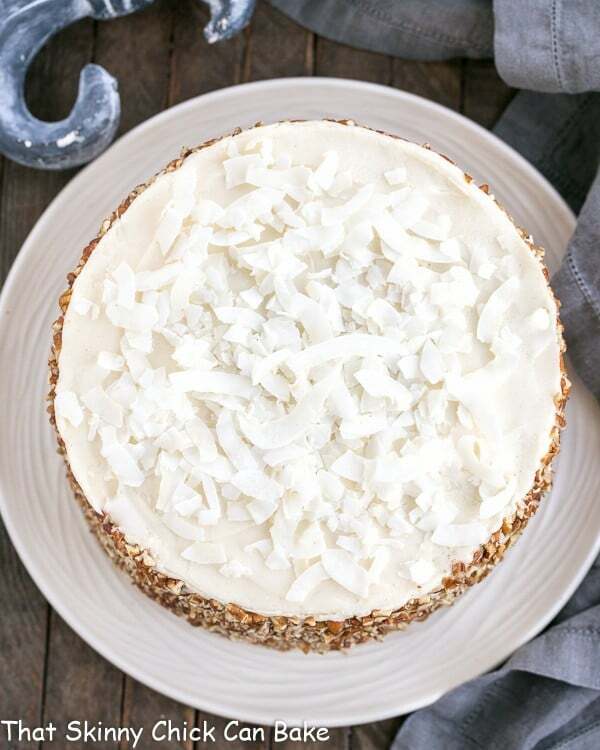 How much difference would it make to the texture if this cake to leave the coconut out? Do you think something else would need to be altered to make it work? I would love to try it. Also, how do you get the nuts arranged so beautifully on the sides? Hi, Carol, I think it would be OK without the coconut. For the nut garnish, I cupped a handful of nuts and gently pressed it into the side of the cake, then repeated. After making a pass around the cake, I pressed in individual nut pieces where there were voids. Takes a little time, but it looks better that way. Great questions. Hope you give it a try! 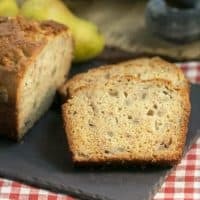 Would the amount of cake be ok to put in a 9×13 pan? I want to decorate with your pineapple flowers. I think you’ll have extra batter. But you could easily make cupcakes from that—and they’d be super cute if you make extra flowers!! 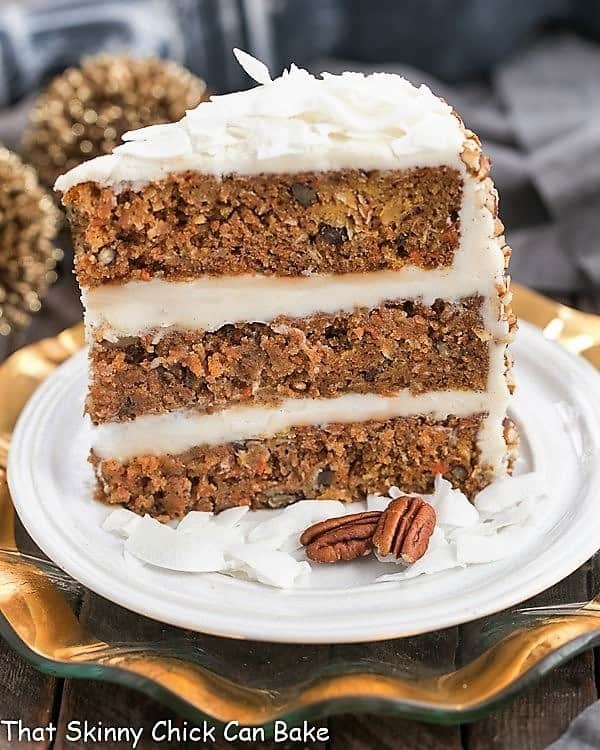 Such a beautiful and tasty carrot cake! We love the pecans and the thick coconut shavings. The caramel takes this to a whole new tasty level. Really fantastic. 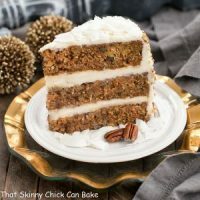 Carrot cake and caramel are two of my very favorite things and yet I’ve never thought to combine them! This is totally genius!! !